I tried using online resources to find the exact chromosomal position and thus find the RSID that corresponds to position -174 of IL-6 gene, but I've found no matches at the location I calculated/found. Thus, I would prefer if someone checked my method and help me correct it. 1) What is -174 in reference to? Start of transcription, start of translation? Which position is that for IL-6 gene in GRCh38 or how does one find it exactly? ENSEMBL and Entrez data for the gene beginning differ, which is probably not uncommon. 2) Is there a resource that gives these alternative names so that one can use them as mapping? 3) Is such data likely to change with genome builds? IL-6 is at 7p21 in the paper, but in the current build it is in 7p15, adjacent to 7p21, if I am reading it correctly. The IL-6 gene, located in humans in the short arm of chromosome 7 (7p21), displays a single nucleotide polymorphism (SNP) in the promoter region (−174 G/C) which seems to be associated to variations of IL-6 gene expression and serum levels (Fishman et al., 1998). The study referred to by OP is a meta-analysis of 9 studies that were published between 2001-2005. Thanks for the reply. Using BLAST is a great idea. Is there a resource that could help me skip BLAST if the sequence has a known accession number? 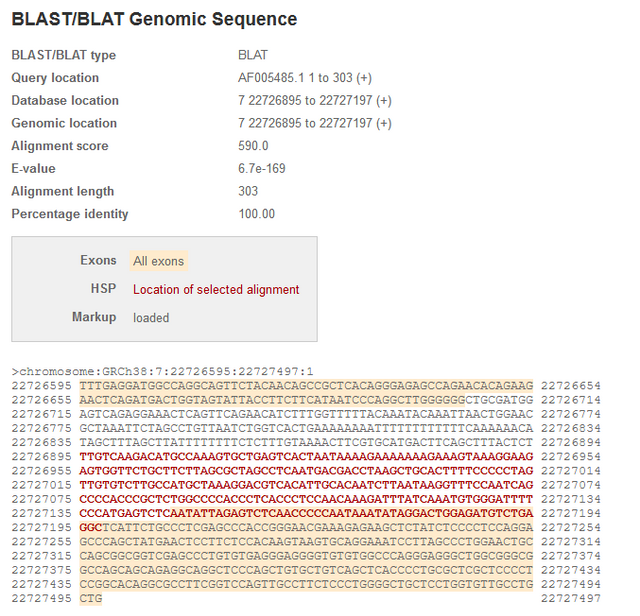 For example, if I know my variant is NM_001105580:c.1394T>C, how would one skip BLAST and directly get the absolute genomic position in the current build? Hey, I've just found the explicit variant: https://www.snpedia.com/index.php/Rs1800795 The position of this base is 22727026. When counting -174 from the end of your aligned sequence, I get a position 22727024. Also, the "real" SNP is C > G. Could you comment on that? And it was sequenced from -550-+61. As a result, -174 is not counted from the end of the sequence as I assumed. Unusual. I can't access the full text as the paper has been published by Elsevier. But let's have a look at what is available without paying for access. Note the publishing date: Jan 2009. GRCh37 was released in Feb 2009. So the data would have been in NCBI36 at the best; perhaps NCBI35? Looking for the term longevity in the newly released Open Targets Genetics, selecting one study (Zeng Y 2016, Sci Rep 26912274) out of many others that match that term, then focusing on the signal on chr 7, that leads me to 7_22768027_A_G rs2069837. Whether or not this is the rsID corresponding to IL-6 -174, I don't know. More exploratory research would be needed. But at least we know the study was not carried out on GRCh37 or GRCh38. Thank you for clearly outlying your reasoning. Inferring gene function from homologus genes.